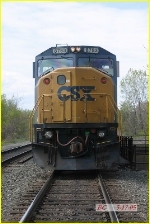 Description: CSX 8753 and a variety of other CSX units are in Acca Yard in Richmond, Va. Description: The trestle across Doodletown Bight, Iona Island, 4:28 PM on 3/27/2005. Description: CSX 7674 leads an eastbound stack train down track 2 as a CSX maintenance crew works to replace a section of rail on track 1. Description: The consistently horrible haze that seems anchored over Philly persists here as the sun decides to hide as the head end of CSX K277 reaches Race while back at Vine, you can see the sun was as good as could be hoped for. Description: Q283 tops the grade at the "Cat Lady Xing" in Washington. Description: This train was sitting in the yard. Description: CSX 8753 is on the point of K650, the Juice Train, at Florence, S.C. Description: A westbound CSX train crosses Hitchcock Creek, just west of Rockingham, NC. 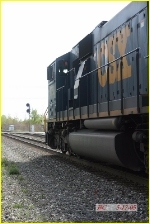 Description: exCOn in charge of a southbound intermodal.